The Spring Framework contains a lot of features, which are well-organized in about twenty modules. These modules can be grouped together based on their primary features into Core Container, Data Access/Integration, Web, AOP (Aspect Oriented Programming), Instrumentation and Test. These groups are shown in the diagram below. 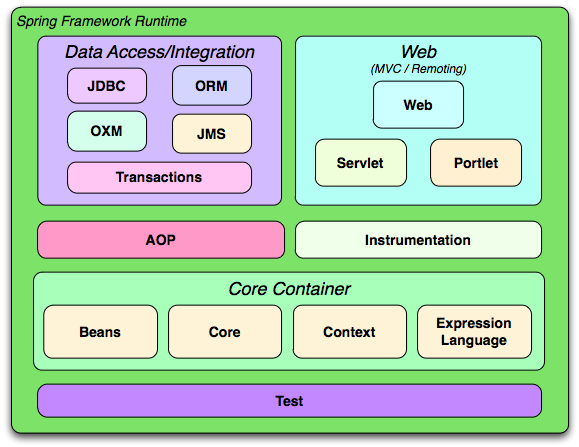 The Core Container consists of the Core, Beans, Context and Expression modules. The Core and Beans modules provide the most fundamental parts of the framework and provides the IoC and Dependency Injection features. The basic concept here is the BeanFactory which provides a sophisticated implementation of the factory pattern. It removes the need for programmatic singletons and allows you to decouple the configuration and specification of dependencies from your actual program logic. The Context module build on the solid base provided by the Core and Beans modules: it provides a way to access objects in a framework-style manner in a fashion somewhat reminiscent of a JNDI-registry. The Context module inherits its features from the Beans module and adds support for internationalization (I18N) (using for example resource bundles), event-propagation, resource-loading, and the transparent creation of contexts by, for example, a servlet container. The Context module also contains support for some Java EE features like EJB, JMX and basic remoting support. The ApplicationContext interface is the focal point of the Context module that provides these features. The Expression Language module provides a powerful expression language for querying and manipulating an object graph at runtime. It can be seen as an extension of the unified expression language (unified EL) as specified in the JSP 2.1 specification. The language supports setting and getting of property values, property assignment, method invocation, accessing the context of arrays, collections and indexers, logical and arithmetic operators, named variables, and retrieval of objects by name from Spring's IoC container. It also supports list projection and selection, as well as common list aggregators. The OXM module provides an abstraction layer for using a number of Object/XML mapping implementations. Supported technologies include JAXB, Castor, XMLBeans, JiBX and XStream. The Transaction module provides a way to do programmatic as well as declarative transaction management, not only for classes implementing special interfaces, but for all your POJOs (plain old Java objects). The Web layer consists of the Web, Web-Servlet and Web-Portlet modules. Spring's Web module provides basic web-oriented integration features, such as multipart file-upload functionality, the initialization of the IoC container using servlet listeners and a web-oriented application context. It also contains the web related parts of Spring's remoting support. The Web-Servlet module provides Spring's Model-View-Controller (MVC) implementation for web-applications. Spring's MVC framework is not just any old implementation; it provides a clean separation between domain model code and web forms, and allows you to use all the other features of the Spring Framework. Spring's AOP module provides an AOP Alliance-compliant aspect-oriented programming implementation allowing you to define, for example, method-interceptors and pointcuts to cleanly decouple code implementing functionality that should logically speaking be separated. Using source-level metadata functionality you can also incorporate all kinds of behavioral information into your code, in a manner similar to that of .NET attributes. The Test module contains the Test Framework that supports testing Spring components using JUnit or TestNG. It provides consistent loading of Spring ApplicationContexts and caching of those contexts. It also contains a number of Mock objects that are usful in many testing scenarios to test your code in isolation.